Personalized Market Tote Giveaway! - WINNER ANNOUNCED - Mom Made That! ::GIVEAWAY CLOSED:: Congratulations to Julie Edmonds! It doesn’t mean you’re shallow just because you can appreciate the beauty of these collapsible market totes. Similar to the other Market Totes offered by Suzi Homemaker’s website, these are a little bit more shallow and they have two handles instead of one. They also have a wider opening at the top and two mesh pockets on the ends to stash your keys or change or other small objects when toting to and fro. Flip down the metal frame and it collapses flat for easy storage. Great for green trips to the market–just fill it with your goodies and go! Also perfect for picnics, toting kids’ stuff, beach towels, or use it as decorative storage in any room. 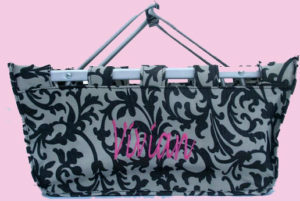 Suzi has LOTS of cute personalized items on her site, so please stop by and shop at www.suzihomemaker.net. Suzi Homemaker would like to give one lucky winner a Personalized Market Tote! To enter, simply visit Suzi Homemaker’s Market Totes come back here and leave us a comment, telling us what color you would pick if you won! Giveaway ends 6:00 p.m. CST on March 31st, 2009. USA residents only please. Good luck!